Sometimes hospital visits take up half of a day with most of it spent waiting to see a doctor, and waiting without certain comforts can make a stressful situation even more stressful. Therefore, based on two decades of patient journey mapping, VIE has compiled 17 simple and obvious ways a hospital can immediately improve a patient’s experience in the waiting room. Patients and their families will want to make and receive phone calls while they wait to see a doctor. With charging stations available in the waiting room, patients are guaranteed to stay charged at all times. Patients can also charge their laptops and other portable devices to stay connected to the Internet as they wait. Almost everyone is online these days, whether it be for personal or business reasons, and the ability to stay connected is important if you have a few hours to kill in the waiting room. To stay connected, patients would need free and fast WiFi connectivity. If Starbucks or McDonald’s can do it, so can a hospital. Patients are already stressed to be in a hospital environment, a clean bathroom with quality toilet paper would only improve the entire patient experience. To have a program that has staff checking the bathrooms twice a day would ensure bathrooms stay clean, or having a sign telling users to alert the staff in the event of a bathroom mishap would go a long way with a patient. Waiting hours to see a doctor can get pretty boring, but having a nice supply of quality snacks will make a patient’s time in the waiting room a bit more tolerable. However, there’s nothing worse than the tease of good snacks when the quality is subpar. Good and free coffee, water and snacks would certainly make a patient’s time in the waiting room much more pleasant. Front desk staff talking amongst themselves and ignoring the patient isn’t the way to greet a patient or families, but unfortunately this obvious tip isn’t carried out in every hospital. Patients are already tense and annoyed to be there. A bad attitude will only make a tense situation even more tense. Train and incentivize your staff to always be pleasant and attentive. First Impressions set the tone for the rest of the experience. Magazines in a waiting room are always a great idea, but outdated and monotone magazines are just depressing. Old and similar magazines are not only boring, but make a patient question the hospital’s tactics. Are they using outdated equipment? Does the doctor even keep up with the latest health trends? Will the doctor understand my specific situation based on my gender or age? Old magazines can trigger many negative thoughts in the waiting room. Keep them current with a wide variety that appeals to various ages and genders. Luckily, most hospitals have caught on to the television trend. Most hospitals and smaller clinics have televisions in their waiting room and patients find it to be a nice distraction. It’s entertaining for kids if the kiddie channel is on and pleasant for patients and family if it’s not on the emotionally charged political channels, which have the opposite effect. Overall, TVs in the waiting room are a pretty inexpensive way to improve a patient’s time in the hospital if done right. Speaking of kiddies, a Kid Station is another great idea for an improved patient journey. Most times parents aren’t able to find babysitters in the event of an emergency and must travel with the kids at a moment’s notice. There’s also the issue of pediatric waiting rooms. A kid station designed specifically for kids of all ages will keep them occupied so adults can calmly deal with the doctor visit itself. Many hospitals have already implemented hand sanitizers in their waiting rooms, although some studies now show that hand sanitizers in hospitals are not strong enough to kill certain bacteria. Determining the potency of your hand sanitizer will have to be researched and decided in-house, but having hand sanitizers available in the waiting room should be a staple regardless. The only thing better than a strong and effective hand sanitizer is a scented one. The extra detail will make patients feel pampered and therefore improving their overall experience. 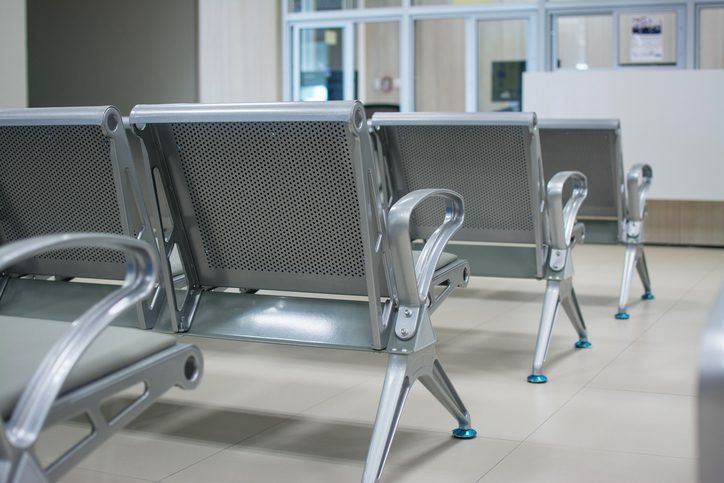 Seats in the waiting room may look nice and match the overall décor, but hospitals should address the issue of comfort. Sometimes the furniture looks fine, but simply isn’t comfortable. Take a look at your waiting room and ask yourself if you would enjoy sitting on that uncomfortable seat for up to an hour or longer. If the answer is no, it’s time to change. Finding your way through a large hospital is difficult enough for anyone not familiar with the building(s), but imagine the frustration of a patient or family member who is in pain or already frazzled trying to find their way around. Some hospitals have started color-coding their departments, overcoming language barriers and making it easy for even a child to find their way. Calming music is helpful in any intense situation. Doctors will many times listen to music during surgery for that very reason. Why not do the same for patients and families in the waiting room? Calming music also sets the tone for the day, helping staff and physicians to start the day on a positive note. Some hospitals have started offering earplugs in the hospital rooms to drown out surrounding noise. It wouldn’t hurt to offer the same in the waiting room because let’s face it, children can be loud. Earplugs help drown out the chaos in the waiting room when unsettled children are around or when there is any other disruptive noise in the area. Hospitals have germs to consider so temperatures in the waiting room are usually kept pretty low. The theory is to deter the spread of bacteria, but low temperatures might also deter human beings from relaxing. It’s best to keep temperatures at a reasonable level so it keeps bacteria at bay while also comforting patients as they wait. Patients and families can get very frustrated when they don’t know the status of their appointment. Staff should come out regularly to communicate any information they have about a patient’s case. Staff should under-promise a time to be seen and over-deliver expectations by transferring them to a room ASAP. A family care center that consists of several amenities will make a visit to the doctor seem like a holiday. Consider a center equipped with a nap room for the elderly and kids, a gym, bathrooms with a changing station in both the men’s and women’s restrooms and even a beauty and grooming area like the Hospital of the University of Pennsylvania in Philadelphia, PA, has done successfully. TVs in general help pass the time while waiting to see a doctor, but personal TVs in the pre-op area take it a step further. TV channels can be manipulated specifically for the patient waiting to be operated because the thought of surgery is nerve-racking enough as it is. Personal TVs will distract the patient with their own choice of entertainment before the big surgery.